Linda Lelii Of Elkins Park (left) and Dianne Chambless of Philadelphia leave the Womens March on Philadelphia on January 20, 2018. But Cooper Morse, who founded the organization that put on the Women’s March on Philadelphia for the last two years, won’t be attending its planned march on Jan. 19, 2019. Meanwhile, the leadership of the national Women’s March group — the organization behind the anti-Trump demonstration that was likely the largest single-day protest in American history — is facing its own scrutiny over allegations of anti-Semitism in its ranks. In Philadelphia, though, the march(es) will go on. Both Philly Women Rally and an affiliate of the national Women’s March organization have obtained permits for demonstrations on the Benjamin Franklin Parkway — on the same day. 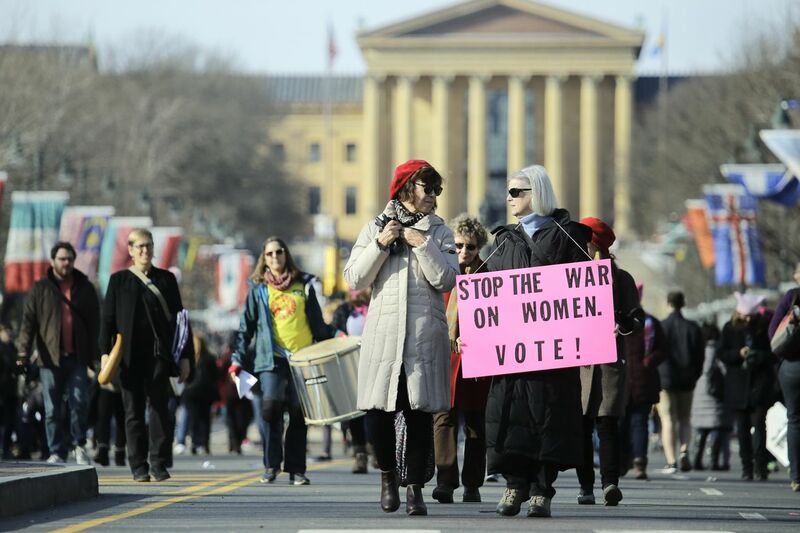 Philly Women Rally, which is being run by six women who sat on its board ahead of last year’s event, has a permit to march on the Parkway on Jan. 19, the day “sister marches” are taking place across the country. For the last two years, demonstrators marched from Logan Square to the Philadelphia Museum of Art, where a stage was set up for speakers and programming. This year’s permit is for the Philadelphia Museum of Art steps and apron, Eakins Oval and the Parkway between 22nd and 24th streets. Deja Lynn Alvarez, who said she’s one of the presidents of Philly Women Rally, said the group hopes to have the same setup this year, but may not have enough cash for a sound system. Women’s March Pennsylvania — which is affiliated with the national Women’s March organization — also has a permit to demonstrate on the Parkway on that day, but its permit is for LOVE Park and the surrounding area. More than 8,000 people marked themselves as “interested” in attending on Facebook. City spokeswoman Sarah Reyes said the administration, which approved both permits, “supports everyone’s right to protest and therefore tries to approve as many applications as possible” within city rules. Emily Cooper Morse speaks next to her daughter, Izzy Morse, 7, to kick off the Philly Women Rally January 21, 2017. This group has existed since the 2017 march that took place the day after President Trump’s inauguration, according to Shawna Knipper, the group’s leader, but it is not affiliated with the women’s marches held in Philadelphia during the last two years. It held smaller rallies and protests in towns across the state. She said Women’s March Pennsylvania organized transportation to the first Women’s March on Washington and is this year planning at least 10 sister marches across Pennsylvania, all under the branding of the national Women’s March organization. “We felt it was very important for Women’s March to lead the march in our name and highlight the work that’s been done,” said Knipper, of Allentown. Why don’t the two groups work together? Knipper said that moving forward, Women’s March Pennsylvania is “more than willing to have a conversation around ways we can all kind of come together." So what’s going on with the national leadership? Women’s March leadership has been under fire for months, which worsened after one of its cochairs, Tamika Mallory, attended a February speech in Chicago by Nation of Islam Minister Louis Farrakhan, who reiterated anti-Semitic sentiments that he’s espoused for years. This week, Tablet Magazine reported that while Mallory and cochair Carmen Perez have attempted to distance themselves from his anti-Semitism, the two asserted Farrakhan’s talking points at the first meeting of Women’s March leadership, including that Jews have exploited black and brown people and were responsible for the American slave trade. Some local chapters have already broken with the national organization, including those from Houston, Rhode Island and Florida, and the founder of Women’s March has called on the cochairs to step down. A crowd gathers on the Ben Franklin Parkway during the Women’s March on Philadelphia, on Jan. 20, 2018. So what happened with the group that planned the march last year? Board members say the group has faced internal strife for the last two years as leaders disagreed about the future of the march. Alvarez and her allies voted earlier this year to oust founder Cooper Morse, saying she exhibited “bullying” behavior. Cooper Morse said that Alvarez was “volatile” and that she became concerned about people’s motives for involvement when another board member, Beth Finn, announced a run for City Council. This week, the remaining six women on the board (including Alvarez and Finn) put out a news release vowing to move forward with a march and accusing Cooper Morse of making “racist, transphobic, and other bigoted comments” as well as “stealing” $19,000 worth of the organization’s funds and “hacking” the organization’s Facebook page in order to delete the 2019 Women’s March on Philadelphia Facebook event page. That caused confusion among hundreds of women who’d planned on attending the march; some believed the event had been canceled. Cooper Morse said she deleted the event because she was informed that Women’s March Pennsylvania had already obtained a permit for a demonstration and saw no need for two competing marches. Once the board voted to oust her, Cooper Morse said she was removed from the group’s checking account. In October, she and an ally filed with the Pennsylvania Department of State to remove the other women from the board. Cooper Morse said she presented the bank with that paperwork and then removed the remaining funds from the account, made out as a check to Philly Women Rally. Cooper Morse is still in possession of the money, which she says is being safeguarded by attorneys until the state determines the makeup of Philly Women Rally and who owns the money. Each side accused the other of filing fraudulent paperwork with the state in order to remove each other’s names from the group’s corporation registration. Alvarez said police have been notified as well.